Welcome to Monday! May you see the beauty in today! Kitchen Tip: When doing a meal prep, keep a list of all the dishes you prepared on the front of your refrigerator. Everyone in your home will know what there is to eat for the week! I am a strong believer in preparing ahead of time! Especially when it comes to meals! You can take an hour or a few hours one day in the kitchen and be prepared for a whole week! I made this meal prep quick and easy by using a rotisserie chicken from Wegmans. They are always $5.00! I created simple, quick recipes and did not spend much time at all in the kitchen! I will be sharing the recipes throughout the week! 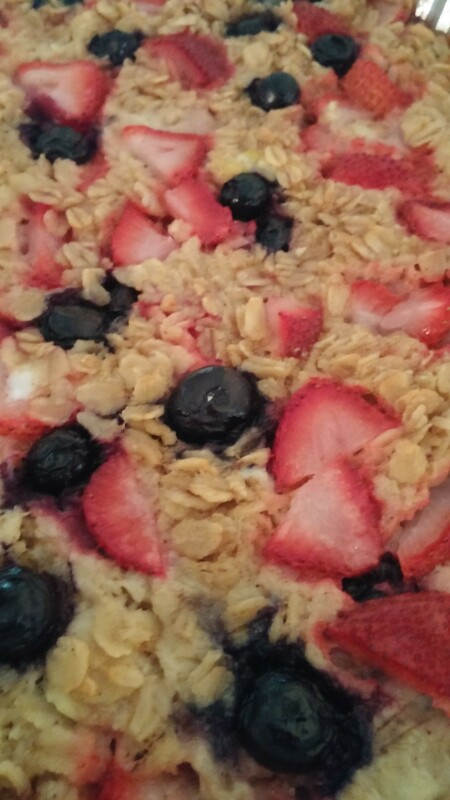 I started with a baked oatmeal for breakfasts, made my version of a wedge salad for lunches and dinners. Using the chicken, I made a simple chicken salad with celery, mayo and spices, made a chicken rice enchilada and chicken and vegetables to use in wraps or lettuce cups. Super easy, Super simple. Stay tuned throughout the week for the recipes! I was inspired to do this post by my sister in law, Teresa! She did this about a week ago and she shared today’s recipe with me. It is from Pinterest by the blogger Inspired By Life. I slightly adapted the recipe to meet my family’s likes. This breakfast meal lasted my daughter and I the entire week! It is a keeper recipe for sure! Preheat oven to 375 degrees. Generously spray a 2-qt pan with cooking spray. In your pan, mix oats, sugar, baking powder, cinnamon, nutmeg and salt. In another bowl mix water, egg, butter, vanilla and mashed banana. Pour over the oatmeal mixture and stir to combine. Place the fruit on top, pressing slightly into the mixture. Bake 30 minutes, until light golden brown and set. Very Delish!